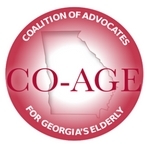 The bills have been dropped and we now have bill numbers for all three of the CO-AGE legislative issues! Please familiarize yourself with them. You can read the full bill at the www.legis.ga.gov website by entering the Bill number on the left hand side search box.